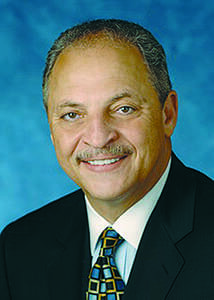 NASHVILLE, TN — Meharry Medical College will honor its ninth president, John E. Maupin Jr., D.D.S. ’72, MBA with the unveiling of his presidential portrait, Friday, May 19, 2017 at 1 p.m. at The Cal Turner Family Center for Student Education auditorium. Dr. Maupin was president of Meharry Medical College from 1994 to 2006. During Dr. Maupin’s presidency, he launched “The Campaign for Meharry” increasing the endowment by nearly $40 million. Meharry successfully exceeded the $125 million goal by more than $2.5 million. During that time, only three other HBCU institutions had successfully raised more than $100 million. Dr. Maupin successfully executed numerous unprecedented initiatives during his tenure as president of Meharry Medical College. With his sights set on solidifying Meharry’s future, Dr. Maupin was able to double the professorships and endowed chairs from six to twelve. He also put Meharry in the “black” by eliminating a $49 million deficit. Dr. Maupin accomplished another fiscal milestone by quadrupling sponsored research and research-related support to $35.5 million. He also re-established the obstetrics and gynecology residency program which had previously closed. Dr. Maupin’s contributions to Meharry have been profound and continue to impact the College to this day. The presidential portrait is a tradition for the college’s chief executives and part of Meharry’s Presidential Portrait Project. Dr. Maupin’s portrait was painted by Nashville artist Jennifer Simpkins.